Cocoon Necklace, originally uploaded by Roberta Warshaw. I saw this necklace in a wonderful place in Tucson called Tohono Chul Park. it is made from cocoons but it didn't say what kind. I always find it amazing at all the wonderful things that can be used to create jewelry. Let's hope they don't hatch though while wearing it! That could be weird! You never know what you are going to find when browsing around in used bookstores. I love finding something wonderful and recently on one of my excursions I came across a book on pin weaving. 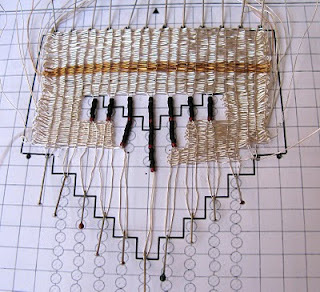 I had never heard of pin weaving. In fact I don't consider myself a weaver really. I have done some card weaving in the past with threads and of course my fine silver weaving for jewelry, but that is about it. So I bought this book called "Beads and Threads" by a weaver named Helen Banes. Her weaving is with fibers but when I saw the book I thought, "what if...." So I proceeded to start a weaving in fine silver wire. I loved it right away. It has so many possiblities. And you can do any shape you want. This is my first try at it. I also love the zen of weaving. I needed it right now because I am suffering terribly from cabin fever. My creativity is at an all time low so this is a good project for me. I am hoping too, when I return from Tucson, I will feel invigorated.